A small airplane crashed in Tumiritinga, Brazil on Tuesday (July 14), reportedly killing the pilot and one passenger, according to Globo News . The plane was part of a two-aircraft convoy dispatched by a local government officials who were to evict a squatters camp organized by the Rural Landless Workers (MST). The crash heightens tensions over an ongoing land occupation. Local police confirmed the identity of the two victims: local mayor and pilot and Genil Mata da Cruz, 39, and copilot Douglas Silva, 25, according to R7 . The cause of Tuesday’s crash is under investigation. Siranildes Eleotério Gomes, a lawyer representing the Central de Minas, told Folha that squatters celebrated when the plane came out of the sky. In one version of events being investigated, occupiers allegedly shot at the plane. Police would not discount the theory as of Wednesday, but say that no bullet holes or other damage were identified in the remnants of the wreckage. MST organizers say that the plane crashed shortly after its occupants shot projectiles, though it was unclear what kind of ordince was used. Some local media have reported that they were flares, while others said that they were fireworks or molotov cocktails made from plastic bags . Gomes told Folha that the pilots were merely surveying the encampment, taking photos as part of a judicial process to legally remove the squatters. MST occupied the land on July 5th, deploying between 200 and 300 supporters, according to local media estimates. Organizers say that the alleged aerial bombardment was only the latest attack on the tent city. 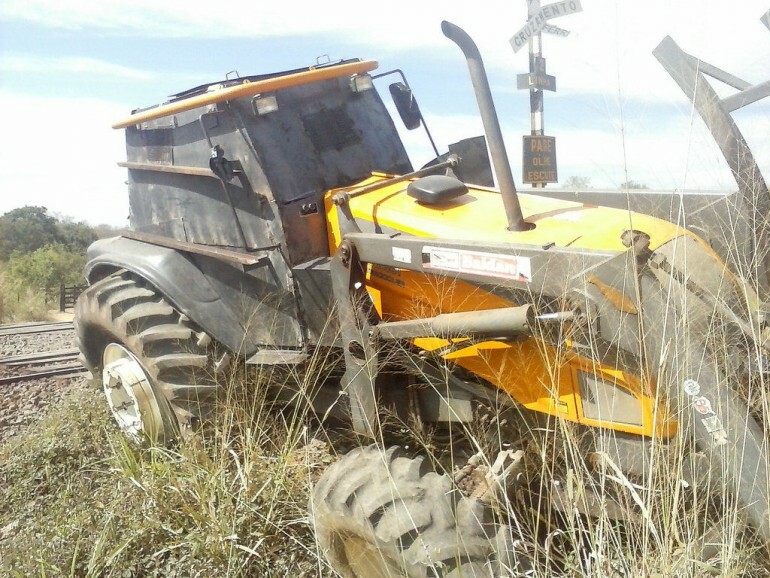 In a statement, MST published photos of an armored front-end loader which they say accompanied an assault on the camp. Those efforts also involved attacks with explosives including flare guns, according to the group . “In the early morning of July 10th, [squatter] families were surprised by 12 gunmen, two [regular] vehicles and two tractors. The gunman shot bullets and flares in the direction of the families’ tents. The tractores were armored, ready for war. [After] the families called local police [the gunmen] left, and one of the tractors [got stuck] in a ditch” the MST statement said. Peasant squatters have been victims of attacks on encampments in the past. In the 30 years that the group has occupied vacant rural land, hundreds of squatters have been killed, according to the Pastoral Land Commission . Occupations are generally swift and organized deployments of supporters who commit to staying on the land with the hope of receiving permission to stay. Organizers benefit from Brazil’s constitutional protections which include the right to housing. This legal tool often helps win squatters legal protections or government-funded resettlements. The MST has reportedly settled over 350,000 families into legal occupations as of 2014, according to the Guardian , with 90,000 currently in illegal settlements. 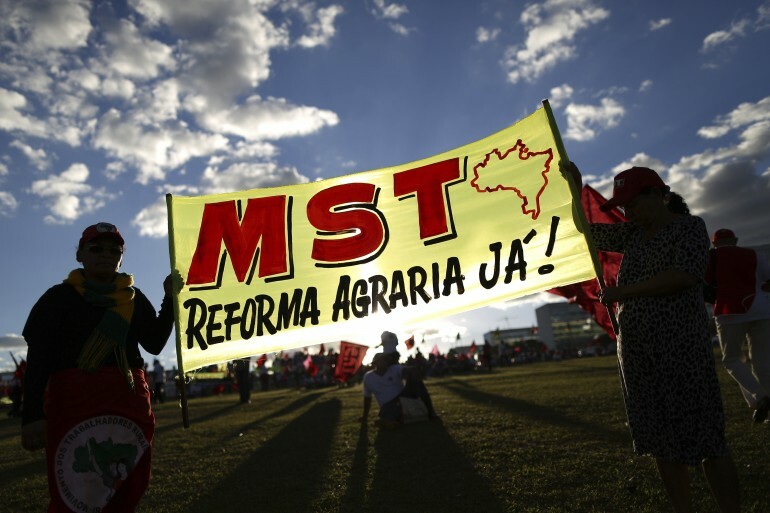 Like its urban counterpart MTST (House-Less Workers Movement), MST gained international attention with high-profile occupations carried out during the 2014 FIFA World Cup. Both groups target vacant land or abandoned buildings. February evictions ahead of the 2016 Rio Olympics generated additional international attention to Brazil’s housing issue.